Introducing the new Sigma AF 150 mm f/2.8 APO EX macro DG lens and hot it performs when given a real challenge. They really haven’t let anything aside when designing the new macro lens and not only did they make it quite functional, it also has a nice design that makes it look good attached to your camera. Sigma has 5 macro lenses that are suitable for APS-C and full frame sensor format. As far as the focal lengths go, these are 50, 70 105, 150 and 180 mm and the brightness is f/2.8 in all cases expect the 180 mm lens that provide a brightness of f/3.5. The 50 to 105 mm focal lengths can be considered to be a bit short for this type of lens and in some cases, users will be so close to the subject that they will actually cast a shadow on it. For a better distance, the 150 and the 180 mm focal lengths are much better. On the other hand, if you do have an APS-C camera with a 1.5x crop factor and you use focal lengths of 150 and 180 mm, you will notice that these are too large for a macro lens and there is a risk of blur from the jitter. If we take a look at the specifications of each version, the 150 mm f/2.8 is a better choice than the 180 mm f/3.5. It is indeed shorter, lighter and not to mention cheaper and no macro lens from Sigma has a built in stabilization system that will help prevent the blur effect. For those who are familiar with the work and models made by Sigma, the matte black finish is enough to find out that this macro lens is a part of the more expensive EX range. For this amount of money, users expect the new Sigma macro lens to be perfect and we can see what attention to detail they had when designing it. The mount is made of metal for more durability and to make it more solid and there is a rubber coating on the focus ring that will make for a better grip. It also comes with a large lens hood that has a bayonet mount and this seems to make a lot of users happy. 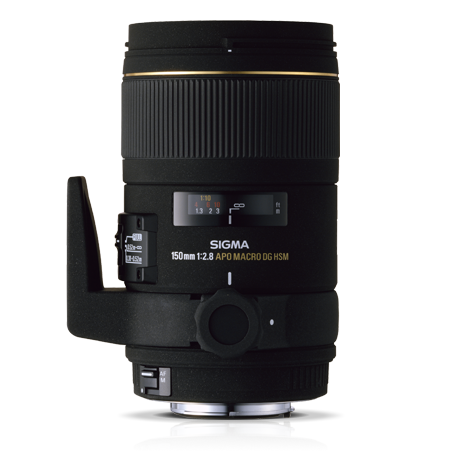 In comparison with other Sigma lens like the 105 mm f/2.8, the Sigma macro lens has 500 grams more and it may seem a bit too heavy but users can remove some weight by eliminating the table from the lens. To see how good it stacks up against other lenses from competitive manufacturers we can compare the Sigma HSM auto focus with the Canon L lenses. In this case, the latter is faster but in comparison with the Nikkor 180mm f/2.8 we will see that Sigma’s AF is much faster. This makes it rank up against some of the best in the field and even beating them. To prevent any bad side effects, there is a limiter that can be set to limit the auto focus range to 52 cm. When using manual mode, the lens can be switched with ease and the manual rotation is just of 270 degrees. There are a lot of options available for users to choose from and the question is if the 150mm is suitable as a portrait lens or not. When trying to do this, the best option is the 85 or the 90mm, both being considered to be perfect for portraits. For a bit more mm to work with, the 135mm or the 70-200mm zoom may seem a bit to large for such a demanding process and it may be an impediment for users that need to get from one place to another quickly and with ease. So, users can opt for the 150mm/2.8 and this one is a bit more modest in appearance and the option to focus at a short distance will definitely come in handy. When the 150mm is used with the Canon 5D Mark 2, the job gets a lot easier in the studio with just one light source. To be fair, the AF from the Canon 5D does help a lot but the Sigma 150mm f/2.8 does rise to the challenge making this combination a very good one. Experienced users know that one of the disadvantages of a full frame camera is that in some cases, the lenses suffer from heavy vignetting when using the maximum aperture. I am sad to say that the Sigma 150mm f/2.8 is no exception and that this problem can also be found with this model as well as other models. It is more of a theoretical problem than anything else because in practice, it is barely noticeable and when the camera is set to a smaller distance, the vignetting is much less. This disadvantage also comes with a common advantage found with telephoto lenses and the 150mm f/2.8 has very little distortion that is not even visible when actually using the camera. To see the real value of the Sigma macro lens, a camera with over 20 million pixels is a good idea and this is where the Canon 5D Mark 2 comes into the picture once more. When using the 2.8 aperture, it works flawlessly and the images are as crisp as possible without any problems whatsoever. The center is crystal clear and to be honest, the edges are not bad at all. Like any other macro lens, the intentional blur is very important because it can complete an image by giving the background a good looking haze. As we are already used to, the Sigma 150mm f/2.8 performs perfectly in this area and photographers will surely have a lot of fun when using it. As a result, we can clearly say that the Sigma 150mm f/2.8 has a wide range of usage when combined with a full frame camera. It is great for any kind of activity and is good in more than ones departments, not just as a macro lens but even as a portrait lens. There are some disadvantages but they don’t damage the results very much when used in practice. The distortion is there but just as an idea and it is not actually noticeable. On the other hand, the vignetting is less subtle. The auto focus works great and it is also fast and without hunting but it does give you the feeling it misses something and a system to prevent blur from the jitter would have been a welcomed feature. The lenses are unbelievable sharp from the 4.0 aperture and this really stands out when shooting pictures and a depth that can be adjusted with a simple switch. All in all, it is perfect for any occasion and it also looks good and as far as weight goes, it is very easy to use. It can adapt to any challenge given to it from big landscapes to portraits and it will always perform at standards that will satisfy even the pickiest professional. Available for a large client base, it will definitely get noticed as being one of the best accessories. Available today, the Sigma macro lens is almost perfect, it does have some problems to work out but it is still good to work with.